Welcome to Williams Realty Online!! Williams Realty is one of the top listing and selling companies in Blount County. Williams Realty has been in business for over 40 years. We are always here to serve Blount, Knox, Loudon and surrounding counties in all of your real estate needs. 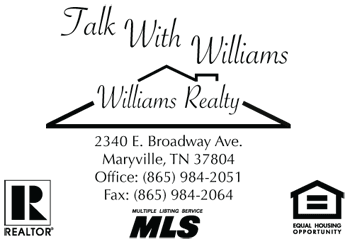 The Williams Realty web page is packed not only with some of the best buys in and around Blount County, TN. We also provide information that will answer many of your questions concerning such items as surrounding Cities, Schools, Government web pages, and a detailed map of Blount County as well. View our Blount County Information page for those details. Williams Realty is currenty seeking Real-Estate Agents. If you have any interest Please call Amy Millward at 865-984-2051 for more information. Featured Listings: Amazing investment opportunities and beautiful homes; these properties won't hang around long! Search! You can now search our website for listings or rentals based on several criteria. Contact any of our agents directly through our website! By registering with or e-mailing Williams Realty you are making an inquiry and granting permission for an agent from Williams Realty to contact you via telephone and/or e-mail.